This book will end the agony that plagues screenwriters of all levels: How to structure a script. This revolutionary technique helps writers structure, write, and rewrite scripts with ease. By asking your characters these four simple questions you will be able to outline your screenplay like magic. 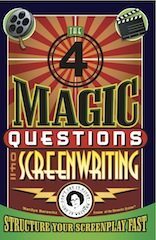 The Four Magic Questions of Screenwriting, taught at NYU for over 10 years, has helped hundreds of writers create their screenplays fast. Completed a screenplay and wonder what to do next? You need a plan, a marketing plan! 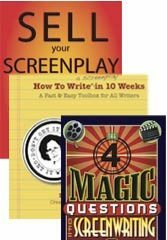 Written by Screenwriting Coach & NYU Professor Marilyn Horowitz, and film business & marketing consultant Paula Landry, MBA; Sell Your Screenplay in 30 Days teaches step-by-step instructions to sell your screenplay using new media & traditional means. This interactive workbook offers tips and tricks for writers & writer/directors to market and sell their work in a systematic and fun way, with clear instructions. Join us and get your work sold! 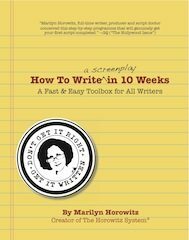 Learn to structure and write your screenplay using Marilyn’s trademarked writing system–it will revolutionize how you’ll write. Her method will take your story to the next level. With step-by-step instructions and a fill-in workbook, even your rewrite will be a breeze. Special Offer – 3 of the most effective writing books available! Structure, write and sell your writing with this triple-threat from Professor Marilyn Horowitz! Find out this December when my new novel, The Book of Zev, is released.